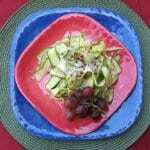 Raw Zucchini Ribbons with Parmesan | JPMA, Inc. Try this spin on pasta and use zucchini ribbions instead. More fiber and high in vitamin A & C, this dish is great for the whole family. Remove the stem end of the zucchini. Using a mandoline, vegetable peeler, or sharp knife, slice off a 1/8-inch strip lengthwise and dispose of it or snack on it. Using this long, white exposed shape as a guide, continue to slice very thin pieces off the zucchini and gently set aside in one layer on a platter. When you get to the end of each zucchini, again reserve the last green slice for another use. Sprinkle 2 teaspoons salt evenly across the strips and set aside for about 10 minutes. The zucchini will tenderize. Blot with a kitchen towel. Arrange all but one of the strips on a serving plate in rows, in a woven formation, or twisted like rosebuds. Drizzle the olive oil across the zucchini. Top with pepper. Taste the remaining strip for saltiness. If they need more salt, sprinkle the remaining salt. Garnish with the thin strips of basil.